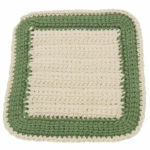 Scalloped Edge CD Trivet -- $1.99 A Crochet pattern from Julie A Bolduc. This trivet pattern can also be used as a matching potholder. Just leave the CD out of it! Plus you can choose what ever colors of cotton yarn you want to match your decor. Use green and red for Christmas for example.